I invented a game for reading-aloud children’s books that are, well…long or potentially boring in the eyes of the child. Poetry! Fact books! In my heart, I know these books are hugely important. I just needed to find a way to engage children and help them see, the way that I see. Or, perhaps the way that I know. I do know, and the “how to do it” just comes to me. The Stop Game is the perfect answer, a solution that children love. Here is how it works: I hold a book up and partially open it, so I can fan the pages with my thumb. I tell the children, “On the count of three, say STOP.” I begin to fan the pages on the count of one. Breathless anticipation is an understatement. I keep fanning the pages, and when I get to three the children yell STOP. Oh, how they yell, because they’re excited. Then, I show them that page, the one when they said STOP. We are learning about dinosaurs this month. Besides making great dinosaur art projects, I wanted to teach children facts. After we used a 100-foot measuring tape in the hallway to see the real size of dinosaurs (Brachiosaurus was 85-feet, the entire length of our hallway), I knew children were ready for more learning. I had a great fact book about different dinosaurs, so we played The Stop Game. Oh my, today is day three of children begging for this. And, they remember the facts! The Stop Game repeated a dinosaur page today. When children asked where the dinosaur lived, Kate blurted out, “Australia!” There is a column along the right that lists location, size, enemy, food, and more. I am grilled on these facts every day. Isn’t that wonderful? Children are excited to learn specifics about dinosaurs. They can’t get enough. They’re four-years-old. Thank you, The Stop Game. Poetry is a fundamental in reading, words, and rhyming. The simplest of words written in poetry have the most powerful meanings. I read poetry to children. And, we play The Stop Game to make the words come alive. Poetry+The Stop Game=Understanding. The first poetry book I fell in love with was Shel Silverstein’s A Light in the Attic. It is a classic, and continues to be one of the best poetry books for children. Every page that The Stop Game lands on, is a good poem. 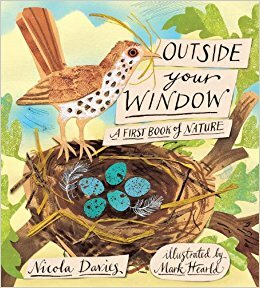 My favorite new children’s poetry book is Outside Your Window. The poetry goes through the seasons and all the animals within each season. There is a wide variety of poetic style, so every poem sparks a different conversation. Children love this book. They love poetry. Playing The Stop Game allows them an opportunity to really listen to the words. It is wonderful. This entry was posted in Early Education, Imagination, Poetry, reading, reading aloud and tagged A Light in the Attic, children's books, Early Education, language development, Outside Your Window, Poetry, Poetry with Children, reading aloud, Shel Silverstein, teaching young children. Bookmark the permalink. Thank you. Poetry is so important, and engaging children so they really do listen is wonderful. Excellent idea!! I always loved children’s books that rhymed. I just published a book for kids. I am also a fair poet and thinking of writing rhyming kids’ books. Great post! Makes me want to be four again. 🙂 Such a delightful way to engage them and make learning fun. Thank you, Marlene. It is really fun! And, if it gets than to listen to poetry, that’s a good thing. I remember a teacher plating a similar game with a dictionary when I was at junior school. Each pupil in class would get to say when to stop. She then read out the word, and we had to attempt a definition. Some chose to say stop immediately, hoping to get an easy word, and others let it run almost to the end. We used to like that, but we were ten years old. Starting younger is a better idea. Why is it that female teachers seem to be more inventive? Male teachers back then were often too serious. You are carrying on a good tradition, Jennie. What a great story, Pete. The fact that you remember means it must have been good, and taught you some vocabulary words. I agree that younger is better. I vividly remember three male teachers. They were terrific. I had some pretty stern female teachers. Perhaps the reason it seems males are more serious is because there are far more female teachers (a shame). Have you seen the movie “Mr. Holland’s Opus?” Richard Dreyfus is the male Music teacher. Great movie! Best to you! I haven’t seen that one, Jennie. I will look out for it. It is one of the best. Promise! I love that film…great example, Jennie! Thanks, Laura! Every teacher should watch that movie. And, everyone who has a connection with high school or music. What a wonderful way to provide children with stimulating and inspiring snippets. I think poems are meant to be savoured, like chocolate – just one or two at a time, if you can stop. Information is the same. Take it in small bursts so you can explore it and discover what it means (like your dinosaur measurements). My current favourite book of poems is “Magic Fish Dreaming” by June Perkins. Her words are beautiful, and matched equally by Helene Magisson’s illustrations. What lovely thoughts, Norah. Yes, poetry is like chocolate and should be savored bit by bit. Thank you for the book recommendation! What a truly wonderful strategy to really engage the kids! I love that they are retaining the facts learned the day before. Thank you for sharing, Jennie! The ‘Stop Game’ is a great idea. Thanks, Jean. It is such fun and makes the learning ‘stick’. My first born (who is 43 this year), LOVED dino’s and learned the scientific names and facts. In 1st grade, as the teacher went around the room to ask and write down “What do you want to be, when you grow up?” ….my son said he wanted to be a Paleontologist! He won a Scepter Award for knowledge of that word. The teacher told me that she had to look it up in order to spell his career choice correctly. I believe it was Shel Siverstein’s A Light in the Attic! that gave my youngest child (26 y/o) his love of poetry. Thank you so much, Ren! I love the story of your children. So glad you shared that. My children also grew up on Shel Silverstein. Best poetry! I still have my copy of “The Giving Tree”, too. Best to you! What a great idea, Jennie! I’m going to play the stop game today with Tornado Boy. I know he’s going to love it. Thanks! What a fabulous game. Games certainly make learning fun! I even used them as an adult educator. Amazing how it worked! Thanks, Darlene. Games do work. Glad I could find one for reading! This is a new, original way of teaching poetry, Jennie. Yes! Dinosaurs are always a delight and an interest. You are so right that The Stop Game allows children to feel in control. It is terrific for dry material. Many thanks! Oh, I love the Stop Game, what a perfect way to get the kids excited about facts and poems. You’ve mentioned one of my favorite movies here in the comments— ❤ Mr. Holland's Opus—must be time to watch it again, it's been a while! Thank you, Marcia. It is a huge hit! I think I need to watch Mr. Holland’s Opus again, too. It’s been far too long. You’re so fun, and I know the kids appreciate your sense of adventure. It makes learning something to which they look forward. Teachers should brainstorm fun ideas together to create happier and more nurturing environments for everyone in the classroom. Superb ideas, Jennie! Thank you, Rose. It is so much fun, and the children don’t even realize they are learning. Teachers do try to brainstorm. And that is exactly why reading aloud is so important, from preschool to high school. Bravo to you, Cindy! 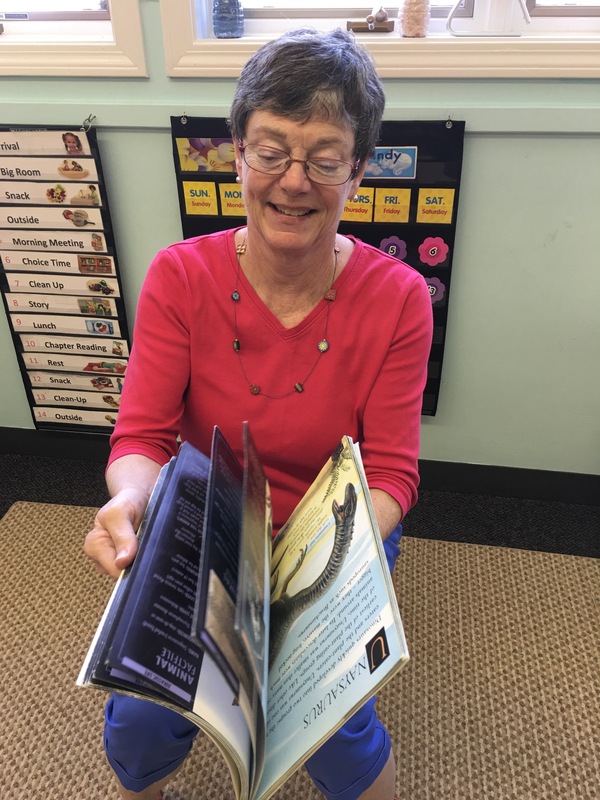 I love hearing about teachers reading to older children. As you say, hearing the intonations and using your voice to make the words and story come alive are hugely important. And, thank you!